Well, don’t worry, if you have fences, posts, gates, chicken coop, barn, shed, and even entire decks to paint but are on a tight budget, you can make your own paint for cheap which lasts for years and years, oh and is natural and safe for the environment. This homemade paint recipe is simple, non-toxic, and it costs next to nothing to make. Not to mention it’s pretty rewarding to make your own outdoor paint. 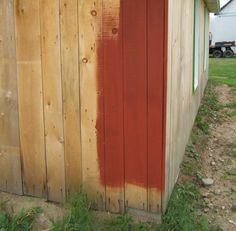 artdec.ca shares an awesome non-toxic natural recipe for making outdoor paint that last between 8 and 10 years. Really! In fact, all paints are prepared according to a simple basic recipe: They are made from pigments (for the color), binders (to bind all the ingredients together), solvents or thinners (to dilute and make the paint easier to apply), and additives (to add specific properties to the paint, such as quicker drying, or protection against mold, etc.). Flour Paint, made from water, soap, linseed oil, pigments, iron sulfate (a common food additive), and flour (you might’ve guessed! ), provides beautiful results, requires little care, will last between 8 and 10 years, all for a fraction of the price of industrial paint: around 30$ per gallon (3.78 Liters). Interested yet? Keep on reading!